Fished Taupo for a change in their very friendly Taupo Fishing Club Competition. Shirley was very helpful in sorting us out and great company - awesome club. Friday Barry Stevens and I launched Kinloch and fished for 3.5 hours - l was lucky enugh to hook 8 and land 7 to 53cm. 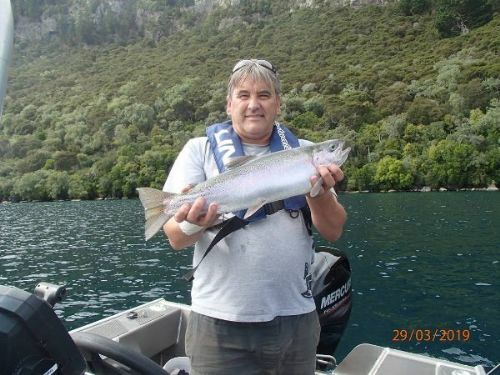 Barry got one - bigger lake than Rotoiti and fish a bot hard to find - fish marked in anything from 28 to 60m! Better arounD 30m. Day 2 - Fished whagamata bluffs, kawakawa bay, whakaipo bay - covered a lot of territory - I hooked 17 landed 12 to 53cm, barry hooked 6 landed 3. Smelt flies in smaller sizes worked for us - finding one or two fish - dropping on them and slowly minkota creeping got us quite a few bites and plenty of action. Kept plenty for smoker - went home with 7kg of fillets! Top fishing!!! I thought Taupo was now the poor cousin of the other lakes for good catches like that!. I think we use the term when creeping very very slowly working the fly moving just with minkota as Jarling... cross between jigging and harling. Also we would sometimes turn off spot lock and drift - same thing moving fly - especially if dropping on fish that wont bite but obviously visable on sounder steering at your fly- just a wee bit of extra movement would attract a strike. The biggest fish of the trip hit the smelt fly while winding up at some speed - ala kingfish styles! Nice work, big fella. Looks like stunning countryside in the background, love the central plateau. From the reports people have been posting at Rotoiti, it looks like a frustrating season there. Hot or very cold. So it's great that you got amongst some nice fish at Taupo. Traditionally, the smelt at Taupo are smaller and lighter in colour than the ones in the Rotorua catchment, but having said that, the Ginger Mick has always been a popular harling fly at Taupo. Hi Lester - yes haven't fished that area much before - stunning all right. Pat really struggling at Rotoiti - landed 68 in police tournament last week - Pat is part Rainbow trout though you know that. Smelt in Taupo that we observed in fishes guts were tiny compared to Rotoiti smelt - maybe just area we fished but doubt it. All my fish bay 4 were caught on grey ghost. 17 on day 2 is top work for Taupo. Well done RF! The introduced trout grew and grew on the local fish until their size started growing smaller and skinnier and a netting regime was set up to reduce numbers with much of the netted trout being bottled and sent to troop during WW1. As trot's food was severely diminished, smelt from Rotorua lakes were introduced to Taupo and they thrived. Maybe another dose of Rotorua smelt...or is it too many small smelt due to their lessened food?? Lake Taupo is nutrient poor, hence the clear water Taupo trout are always starving. Too many trout and not enough smelt Only solution is more harvest to bring the two into a better balance. That is why the limit has been increased to 6. No point putting slabs back. To get a better idea of what is really going on you need to talk to DOC's fishery scientist Michael Dudeal.